Our bodies are contradictory objects. They can be incredibly sturdy and resilient, but they also have certain components that are incredibly fragile. The network of organs that handles your breathing is a great example. It runs efficiently and you can seemingly do a fair amount of damage to it in various ways without any consequences. But at the same time, one cough or virus can upset the entire apple cart. That’s why it is important to keep tabs on the respiratory system and the things that can happen to it. Take granulomatosis with polyangiitis (formerly known as Wegener’s granulomatosis). 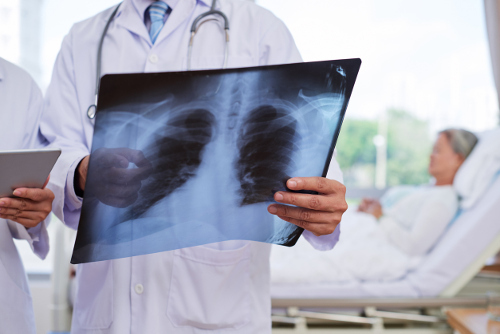 It’s a disorder that can do a lot of damage to your respiratory system, and its reach can also spread to unrelated organs. Still, not much is known about it due to its rarity. Today, we try to shine a little bit of light on this condition for those 1 in 100,000 people affected by it. What Are Causes and Symptoms of Granulomatosis with Polyangiitis? Granulomatosis with polyangiitis is a disorder that causes the inflammation of the blood vessels and tissue masses in your nose, sinuses, throat, lungs, and kidneys. This inflammation causes the slowing of blood flow to these organs. In terms of causes, experts know very little except that it is not a type of cancer, and that it tends to occur after an infection or inflammation that causes the immune system to respond abnormally. If left undiagnosed and untreated, more severe symptoms can rear their heads. If left untreated for a long period of time, granulomatosis with polyangiitis can cause rather terrible things like coronary artery disease, meningitis, and even brain lesions. It can also do lasting damage to your respiratory tract and nervous system. And ultimately, if left untreated, the disorder can be fatal. With all of this taken into account, it’s pretty safe to assume that the sooner it’s diagnosed, the better. As you can see by the early symptoms listed above, granulomatosis with polyangiitis symptoms can mimic those of a severe cold. At what point do you go see a doctor, and how will they determine a diagnosis? In a basic sense, a cold shouldn’t last too much longer than 10 days. And blowing your nose shouldn’t come with blood and pus. Therefore, if you notice your cold symptoms sticking around after 10 days and you’re getting extra material in your mucus, seeing a doctor is a good idea. The doctor will begin the diagnosis by studying your recent medical history in order to rule things out that might provide a more reasonable explanation. If the diagnosis is still a mystery, a number of tests including urinalysis, X-rays, or a blood test for antineutrophil cytoplasmic antibodies (ANCAs), could further pinpoint a diagnosis. If tissue masses are found at that point, a biopsy can be performed in order to verify a diagnosis. Physically, the doctor will be looking for a few signs, including a loss of height in your nose or saddling. That loss of height can be a sign of cartilage weakening due to the granulomatosis with polyangiitis. After all of this, once there is a positive diagnosis, treatment can begin. Wegener’s granulomatosis treatment or granulomatosis with polyangiitis treatment is, in a word, rough. Given that it can do a lot of damage to the body, especially if it gets into the organs, treatment needs to effectively clear it out or send the disorder into remission. This means the commonly prescribed drugs tend to be on the heavy duty side with some side effects. If the illness is caught and treated early, your medications may only include corticosteroids. The goal is to get rid of the pain, inflammation, and infection, for which the corticosteroids work well. But they do have some side effects like sodium retention, and women who are pregnant may be at risk for birth defects. If granulomatosis with polyangiitis is caught later on, you will be on some serious medications that can also produce serious side effects. Drugs like cyclophosphamide or rituximab are widely used to treat mid and late stages of the disorder, and can work effectively in most patients to send their disease into remission. However, these drugs are immunosuppressive medications. The theory is that the disease is basically a result of your immune system going off the rails in efforts to attack a perceived threat. If you suppress the immune system, it should allow for everything to clean up. The side effect of this suppression is that it opens the door for all sorts of viruses, infections, and diseases. Patients on these drugs have to be monitored fairly closely. Furthermore, they are only used until remission, at which point another crew of slightly less immunosuppressive medications takes over to maintain the remission. The drug treatments to maintain the remission may last for a few years before you are declared free. The good news is that granulomatosis with polyangiitis or Wegener’s granulomatosis is highly unlikely to affect you. It probably won’t even affect a person you know, as only 1 in 100,000 people are ever diagnosed with the disorder. But, if you suspect you are suffering from the symptoms of granulomatosis with polyangiitis, it’s best to see a doctor right away. In a best case scenario, they will tell you that it’s just a cold and not worry about it. Worst case scenario: You have granulomatosis with polyangiitis, but you have caught it early enough for treatment to work quickly. Nordqvist, C., “Wegener’s granulomatosis, or granulomatosis with polyangiitis (GPA),” Medical News Today, March 14, 2017; http://www.medicalnewstoday.com/articles/187807.php, last accessed May 9, 2017. Gota, C., “Granulomatosis with Polyangiitis (GPA) (Wegener Granulomatosis; Wegener’s Granulomatosis),” Merck Manual; http://www.merckmanuals.com/professional/musculoskeletal-and-connective-tissue-disorders/vasculitis/granulomatosis-with-polyangiitis-gpa, last accessed May 9, 2017. “Wegener’s Granulomatosis (GPA),” Cleveland Clinic, February 18, 2014; https://my.clevelandclinic.org/health/articles/wegeners-granulomatosis, last accessed May 9, 2017. “Granulomatosis with Polyangiitis,” Mayo Clinic; http://www.mayoclinic.org/diseases-conditions/granulomatosis-with-polyangiitis/home/ovc-20167226, last accessed May 9, 2017.